His naturalization record, and the census records refer to him as Joseph D. Wyburn, Sr. 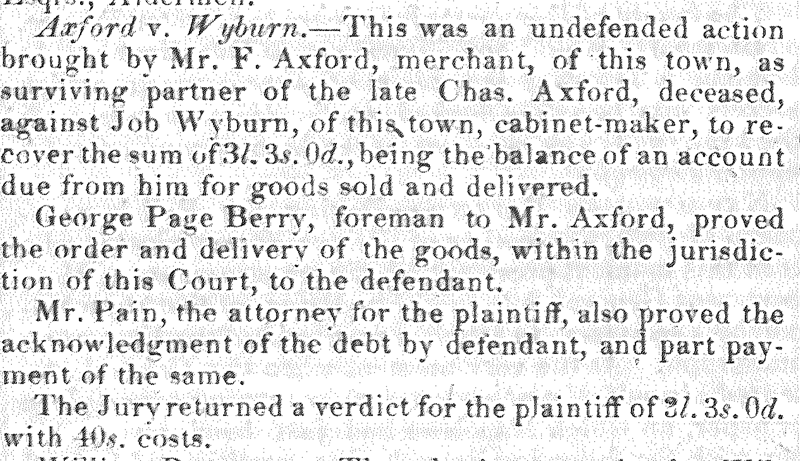 It appears that his birthname was Job Wyburn; this was his father and his grandfather's name. Job Wyburn was also the name in which he is found in the 1841 England Census. But once he got to the United States, he seems to have changed his name to Joseph D. Wyburn. One thing to ponder is his middle initial D. Did this perhaps represent his mother's middle name, Dicker? His age was listed as 65, but that is incorrect. Ohio Death record says he was born 1814; however, that is probably information provided by his third wife who really did not know. No burial location listed on his death record. Rachel Ann is one of the most elusive of our ancestors. Who were her parents? Where and when was she born? How and when did she meet Joseph D. Wyburn? Where is her grave site? This page is dedicated to Rachel; yet there is not even a picture to add some substance to our ancestor. [S9] Family Search (Church of the Latter Day Saints), England Births and Christenings, 1538-1975," index, FamilySearch (https://familysearch.org/pal:/MM9.1.1/NT7S-TDC : accessed 17 May 2014), Job Wyborn, 11 Feb 1806; citing Somerset, England, reference ; FHL microfilm 1526554. [S9] Family Search (Church of the Latter Day Saints), "England, Births and Christenings, 1538-1975," index, FamilySearch (https://familysearch.org/pal:/MM9.1.1/NT7S-TDC : accessed 13 Aug 2012), Job Wyborn, 11 Feb 1806; citing reference , FHL microfilm 1526554. [S279] Bridgwater Advertiser, 20 Apr 1831. [S86] ua, UK, Poll Books and Electoral Registers, 1538-1893 [database on-line]. Provo, UT,. [S24] Miscellaneous, Email from John Vost, dated 4/4/2011 Original source John Fuller Memorial List. [S23] Citizenship papers, State of Ohio, Hardin County 14 Oct 1856. [S23] Citizenship papers, State of Ohio, Hardin County, 24 Oct 1856. ["HARDIN COUNTY, OHIO, NATURALIZATIONS."] In Track and Trace (Hardin County Genealogy Society, Kenton, OH), vol. 3:4 (Dec. 1985), p. 35. Date and place of naturalization. Extracted from records at the Hardin County, Courthouse. Page of journal wherein record is written is also provided. [S86] ua, ["HARDIN COUNTY, OHIO, NATURALIZATIONS."] In Track and Trace (Hardin County Genealogy Society, Kenton, OH), vol. 3:4 (Dec. 1985), p. 35. [S9] Family Search (Church of the Latter Day Saints), "Ohio, Deaths and Burials, 1854-1997," index, FamilySearch (https://familysearch.org/pal:/MM9.1.1/F62X-F6T : accessed 13 July 2012), Joseph Wyburn, 1892. [S95] Marion County, OH, Marriages Book 6, Pg 197.